The walk from Terradillos de los Templarios was another rather non-descript walk along the 'sendas' which are pilgrims' pathways alongside of the highway. Today´s path was very rocky and uneven and difficult to walk on. We were pleasantly surprised to find a bar open at Moratinos at 7:30am so we had a tea, cafe and sweet croissant. Despite taping the ankle, every step was painful and consequently I was painfully slow - a trail snail but we just kept plodding along with only a couple of quick stops in Sahagun at a 'tienda' for food and a 'farmacia' for some trainers´ tape for my ankle. Dayton had heard about a newly renovated alberque in Bercianos which featured an evening communal meal and pilgrims´service which appealed to him. I was ambivalent so we took the alternate camino route to Bercianos. Bercianos Real Camino was, like so many of the other older towns along the old camino route, almost deserted and very run down and the alberque didn't look much better, just an ancient crumbling clay building on the verge of collapse. The alberque, run by a very quiet hospitalero and a grandmotherly hospitalera seemed rather unassuming and not that promising. A pleasant surprise was in store for us. Pilgrims are encouraged to help with the evening meal preparations and that´s when things started to look up. 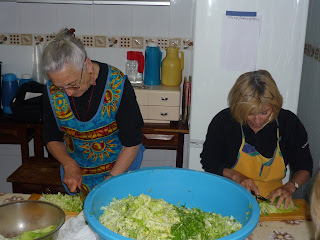 The senora wrapped me in a huge apron and set me to slicing and dicing vegetables for the eveníngs' lentil stew and salad. She was most precise that everything be cut up muy pequeno, muy pequeno exactly the way she wanted and she supervised every cut. With three other peregrinas, I cut veggies for well over an hour. She did not understand the concept of 'vegetariano' and just couldn´t bring herself to save me a bowl of the lentil stew before the chorizo sausage had been added. It smelled so good and I was more than a little disappointed. However, the more we worked, the happier she was. The bowl of salad and the pot of lentil stew were each the size of a large washtub. Just before dinner she did scoop me out a big bowl of the stew right before the chorizo was added and set it aside for me. Thank goodness. About 35 peregrinos sat down a long, long tables to this wonderful meal accompanied by bread and wine. The senora hospitalera positively radiated joy and she beamed as she served her peregrinos. This alberque is run by these two wonderfully charitable individuals out of the goodness of their heart and they asked only a donativo, a donation to offset their costs. It was just a great experience and a great night. We left the next morning, Wednesday, after a generous desayuno, breakfast spread and with hugs and 'buen camino' to see us on our way. Again the walk today was along sendas, this time tree lined. With my ankle stabilized with trainers tape and a lot of Advil and Tylenol, I managed to walk the 34kms to Vilafrente with a lot less pain than I expected. Nothing out of the ordinary distinquished this walk. It was just long, level and peaceful. Tomorrow we'll be in Leon. Sorry for the pain of the trip. What is your estimated date of finish? We might get to Santiago around May 26/27, stay a day, then a three day walk to Fisterre and then a bus back to Santiago. Don´t know what happens between then and June 8th when we return from Madrid.